So I had a little look back and I've been using Evernote since 2009 and writing about it on and off since 2012! I've showed it to almost every client I have worked with, and early in 2017 I become a Certified Evernote Consultant. So it's hardly surprising that I would call it a VITAL tool for getting organised. We use the term "organised" alot these days an so lets clarify what it actually means! And why do we want to become organised? There is always a purpose or a goal that getting organised helps us to achieve. You may want to reduce the stress that chaos brings. Or you may need to get more done in less time, by being able to find all the information we need for a particular project. and having access on an unlimited number of devices. More info on plans here. Evernote (or similar products like OneNote) can be your digital filing cabinet, junk drawer, planning journal, study notebook, and inspiration board all in one place. It goes with you everywhere. It can clear the clutter of sticky notes and papers from your benchtops and help clear your mind. Just start simple and have fun with it. Your friends and loved ones will be wondering how you became so organised! 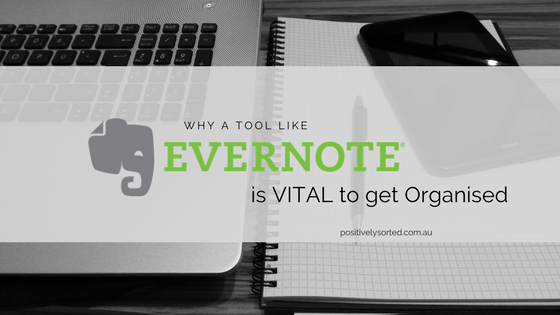 I've talked about the basics and some of the ways you can use Evernote for personal use here - and another post about using it to organise books, articles and emails you want to read later here. I talked about different types of business information you can store in Evernote here. And here's an older post about how you can use the Reminders function.